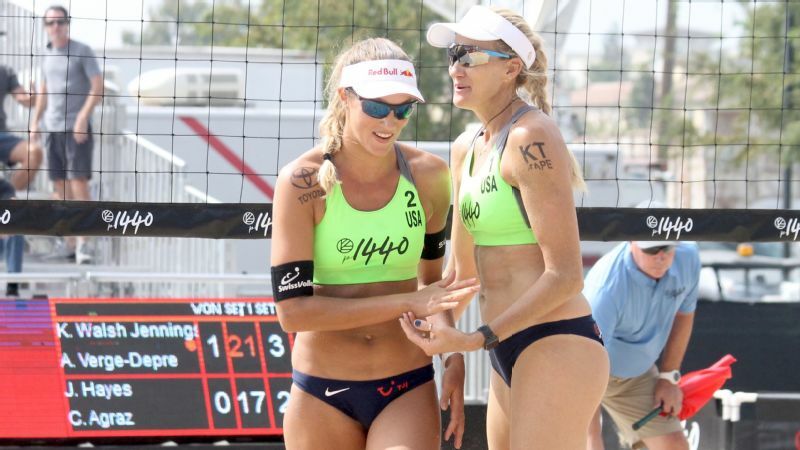 Kerri Walsh Jennings partnered with Anouk Vergé-Dépré in the first stop of the p1440 event series. SAN JOSE, Calif. -- Kerri Walsh Jennings moved around the backyard of her childhood home with as much ease as she moves on the sand. She pointed one of Brazil's best beach volleyball teams to the pool to relax. She directed her partner for the week, a rising Swiss star, onto the patio. She offered a reporter some water. Even the family dog ambled about contentedly. Less than 48 hours before an audacious test of her own brand and vision, the first in a series of events mixing pro volleyball, live music and personal wellness, Walsh Jennings had everything under control. Suddenly, she apologized and excused herself. This generation's most accomplished beach volleyball star needed to dash to a nearby store. Otherwise, she and her guests wouldn't have enough volleyballs to practice with at the community college a block away. It is one thing to lend your name to an endeavor. It's quite another to shop for the supplies. Small as it was, the errand was indicative of her investment in an idea that is dependent on Walsh Jennings even as she hopes it becomes a movement much bigger than one person. The public might not know the name p1440, the label encompassing the new event series and lifestyle app she helped launch. But a lot of people know about the three-time Olympic gold medalist with the California vibe. She is testing how much that's worth. She is banking it's enough to change a profession. Walsh Jennings wants to stand atop beach volleyball one more time. Only nine women, mostly American basketball players, have won four gold medals in one Summer Olympics event. Walsh Jennings wants on that list. She will go through all who get in her way. Except that in her version of a final act, she wants to elevate her rivals with her. Using popularity and power accumulated over a lifetime, she believes she can shape a more viable future for the men and women who play her sport. And so, a few miles north of the house where her parents live, roughly 2,800 tons of sand temporarily transformed parking lots and streets around San Jose's Avaya Stadium into a home for both a beach volleyball tournament and an experiment. "It's almost like it's Christmas Eve, and I'm having a baby, and I'm throwing a wedding that I hope people show up for and have a good time -- all wrapped into one," Walsh Jennings said after returning with the essentials for practice. "So it's pretty intense." Walsh Jennings played the San Jose event in September, the first for p1440, with Swiss Olympian Anouk Vergé-Dépré but announced soon thereafter that American Brooke Sweat will be her new full-time partner in preparation for the 2020 Olympics. The new team will debut in this week's second p1440 event in Las Vegas, which counts toward Olympic qualifying. Through injuries and the dissolution of her partnership with April Ross, with whom she won a bronze medal in the 2016 Olympics after three straight gold medals with Misty May-Treanor, Walsh Jennings hasn't finished on the podium in an FIVB international tour event in more than two years. But healthy again, if still competitively rusty after a third-place finish with Vergé-Dépré in San Jose, she isn't back for merely a farewell tour. "My goal is to qualify as the No. 1 team in the world, and then the goal is to win the Olympic gold medal," Walsh Jennings said. "I have a lot of work to do. But I'm not afraid of doing hard things. I look at the global landscape -- we're better than we've ever been. [The international] tour -- it's very deep on the women's side. "But I believe everyone is very beatable." Visitors to p1440 events can expect to be surrounded by volleyball, music, fitness and fun. It speaks to the power of a generation that rose to prominence in the wake of the 1996 Olympics and the platform that competition afforded women's team sports that Walsh Jennings is not alone. Carli Lloyd has a World Cup to retain next year, but the 36-year-old has spoken of Olympic gold two years from now as a meaningful finish line. Now in their mid-30s, Monica Abbott and newly un-retired Cat Osterman are driven to pitch Team USA to softball gold in Tokyo. Although she will be 38 in 2020, Diana Taurasi wants the same on the basketball court. They all have staying power. But as involved as those athletes remain in growing their sports, none will simultaneously attempt anything like what Walsh-Jennings is doing with the p1440 series. The name is double shorthand, the abbreviated form short for Platform 1440. The specific number, in turn, refers to the idea of making the most of the number of minutes in each day. It's the mantra by which Walsh Jennings said she and husband Casey Jennings attempt to live their lives and raise their children -- albeit, by her own admission, regularly falling short of such extended serenity. Still, the seed from which p1440 grew was taking that attitude and building an event around it, an event that included beach volleyball as a pillar -- not just an event dependent on the sport alone. It's almost like it's Christmas Eve, and I'm having a baby, and I'm throwing a wedding that I hope people show up for and have a good time -- all wrapped into one. Surround beach volleyball -- the embodiment of a healthy lifestyle, with its outdoor setting, relaxed atmosphere and chiseled bodies -- with the tools to live a better lifestyle. Give people access to seminars with experts on breathing techniques, or let them take yoga classes. Put up a stage, and bring in musical acts that aren't just background noise but draw in their own right. Then give them an online community to make the experience live on long after the sand is cleared away (to be reused in area schools). "The lifestyle of beach volleyball and the human beings in this sport, the community, is so special," Walsh Jennings said. "And the world understands that once every four years, and then we go away. Our goal with creating the festival experience is to make people curious." Yet surrounding volleyball with all of those things requires having volleyball. As much as p1440 markets itself as a celebration of a healthy lifestyle for customers, its success might be dependent on its ability to make life better for the labor force. Walsh Jennings was the highest profile among a handful of players who had a well-publicized 2016 split with the AVP, the longstanding domestic beach volleyball tour in the United States that went bankrupt in 2010 and was subsequently purchased and relaunched by Donald Sun. A primary point of contention was what amounted to non-compete clauses that limited top AVP players to only that tour's domestic events plus FIVB international stops in the U.S. There were eight AVP stops in 2018. The number was good for a tour that can't afford to overextend but bad for the players who can't afford much on their paychecks. Walsh Jennings insists that her goal is not to supplant the AVP (or the FIVB, the international body with which p1440 is partnering for the Las Vegas event) but to augment what is available to players. "When you graduate college after playing four years of a very high level of collegiate beach volleyball, we want you to have a home," Walsh Jennings said. "We want you to have the Olympics as well, but ultimately, we need to have the NBA model, where the tour itself, the league, people cut their teeth on and make their money. And then the Olympics is like the sacred cherry on top." A 2015-16 National Federation of High Schools study found a growing participation rate for girls in (indoor) volleyball, even at a time when youth participation rates in sports as a whole in the U.S. are slipping. More than 50 NCAA schools sponsor Division I beach volleyball, many in expected West Coast locations but also the likes of Boise State and Central Arkansas. "The only sick part of us is the professional side of the sport," Walsh Jennings said. "Where the athletes train like professionals -- they're legit, they are so damn good. But they are being paid like hobbyists. That's not sustainable." The first morning of the main bracket in San Jose felt more like any athletic tournament than a festival. With work and school likely tamping down attendance, most of those wandering around the venue under temporarily overcast skies gravitated to the side courts lined up end to end on what is normally a street separating Avaya Stadium from office parks. The early crowd appeared there for the volleyball, not anything else. Former Wisconsin standout Sheila Shaw moved to California hoping to keep her beach dreams going for another few years. Throughout the morning, the dozen or so kiosks and tents set up along the main promenade were mostly deserted. The workout equipment was undisturbed, and samples were untried. Not far away, a line of food trucks did a brisker business in smoothies. On center court, the bleachers were mostly empty as Sheila Shaw and Alexa Strange lost the first set but rallied to win the next two and the match against Tina Toghiyani and Alicia Zamparelli-Flavia. It wasn't a match that would ultimately have implications on the outcome of the tournament, but it spoke to the tournament's purpose all the same. Shaw was an indoor volleyball third-team All-American for Wisconsin in 2005. She played in France and Germany professionally indoors for three seasons. When she switched to beach, she won a minor pro event in Milwaukee in 2011. At 6-foot-1, she looks the imposing part when she rises above the net for a block. By any absolute standard, she isn't an average player. It nonetheless became quickly apparent to her when she relocated to the West Coast several years ago that beach volleyball wouldn't pay the bills. It also offers little time for players to learn and grow. "When I first moved out to California, I wanted to do this full-time," Shaw said. "But I'm a little too not chill. I like knowing where my paycheck is coming from. And I also was not having much success, enough to live on. I needed a Plan B. Now I have a little more stability." During regular business hours Monday through Friday, or at least most Fridays, she is a marketing manager for a software company in El Segundo, California. Her goal isn't Tokyo in 2020. She just wants to be more than a recreational player for a few more years. "This is my passion and love," Shaw said. "I'm just so happy and thankful that there is another tournament to pay. I thought the [AVP] season was over, and now I get to play again." The lament is familiar for the many sports that capture public attention during the Olympics and then drift out of focus, though few draw better Olympic ratings than beach volleyball. The lack of consistent earning opportunities eliminates much of the middle class -- people like Shaw. 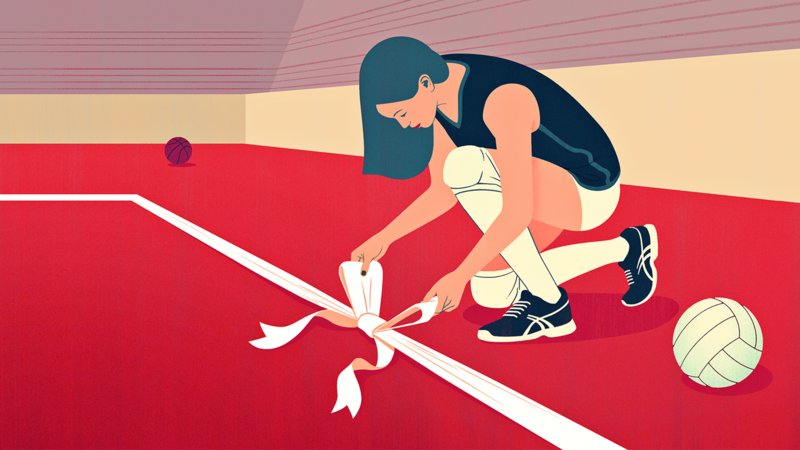 As fans of sports from softball to swimming can attest, that stunts a sport's growth. Success stories thus become tales of extraordinary perseverance rather than mere skill development (which, ironically, feeds the narratives that tug at our hearts in the Olympics). One of the top-ranked teams on the FIVB tour, Brazilians Carolina Solberg Salgado and Maria Antonelli, were among the headliners in San Jose. Their presence, like that of eventual winners Heather Bansley and Brandie Wilkerson of Canada, lent the debut event instant competitive credibility. Carolina Solberg Salgado, half of one of Brazil's top teams, thinks p1440 can help solve the financial obstacles beach volleyball players are constantly trying to clear. As one of the top three teams in a country synonymous with the sport, Solberg Salgado and Antonelli are well supported by the sport's organizing body in Brazil. They traveled with their coach and used the event in San Jose, which wasn't an Olympic qualifier, to prepare for Las Vegas. But it was just two years ago that they came together as a team. Solberg Salgado had recently returned to the sand after the birth of her third child, and the team had to pay its own way around the world to try to collect the necessary rankings points. Even now, with so many talented Brazilians around them, the pressure to remain among the top three and keep funding is relentless. "Even making good results, we were just paying our tickets and everything," Solberg Salgado said of barely breaking even in 2017. "We did it because we love it. I play mainly because I really love to be in the court. The feeling that I have when I'm in the court is something I will keep forever with me. That's the most motivating thing for me. "But of course, that's my job. I need to make money. I need to pay my bills." That is life for a team at the very top of the sport. Total prize money for the San Jose event was $300,000, comparable to that available on the AVP. For finishing third, Walsh Jennings and Vergé-Dépré split $12,000. For finishing 17th, Shaw and Strange split $2,000. With eight p1440 events planned for 2019, an athlete able to play both tours could double her prize money while at the same time reaching more audiences and expanding her brand for sponsors. "Beach volleyball we know has the potential to be one of the biggest sports," Vergé-Dépré said. "There is the emotion. There is an athletic fight on the court. Everyone who goes to the stadium is like, 'Wow!' But we need to put that image and spread it so also people that are not in the stadium can experience that. "Right now, the athletes haven't had a voice for a long time." That led her to cofound the International Beach Volleyball Players Association, which lacks collective bargaining power with the FIVB but advocates for players and their concerns. Among the most common issues is the basic access to competition, a way for players to make a living without constantly chasing Olympic points around the globe. The more stable their lives, the louder voice they have. Kerri Walsh Jennings hopes she has one more gold in her own future, and she's fighting for more riches in her rivals' futures. "Just like any business, the burn comes very, very quickly," said p1440 managing partner Kasia Mays, a former competitive skier whose business background centers on the luxury end of the hospitality industry. "But we are also very adaptive to the climate. Part of it is that for many of us, with the exception of Kerri, volleyball may not necessarily be our No. 1 business model because we all come from different industries. However, the business concepts of being able to adapt to the climate and see what is working and what isn't working is something we're not too humble to be able to do." Khadija Zanotto had the guacamole -- or rather, she didn't have the guacamole -- to back her assessment that opening day was a success. The third generation of the namesakes of Zanotto's Family Markets in the Bay Area, she had just two plastic tubs of fresh guacamole left in the stall set up along the main promenade. More used to farmers' markets than sporting events, she received a call from Walsh Jennings, who grew up with the stores. The volleyball star wanted to know if Zanotto would be interested in a place at the event. Zanotto didn't hesitate. The lunch rush Friday kept her busy, she said. She was already a little worried that the stall might be understaffed for the next day. The organization did not release attendance figures or ticket sales for the three-day event. "We really believe in what they are doing," Solberg Salgado, the Brazilian star, said. "It's not like we are here [just] because we are friends. We believe in this concept of a tournament, the ideas they have to put everything together. It's important for the sport to have this. With this, I think we can grow." As dusk approached in San Jose and the matches wound to a close, cars continued to arrive in the parking lot. Athletes made their way to rest before play resumed in the morning, and fans who wouldn't see a point of volleyball prepared for Marian Hill to open for Grouplove. As the first notes of Marian Hill's "Down" spread over the audience, it wouldn't have been at all surprising to spot Walsh Jennings nearby, ready and willing if anyone needed her to run to the store for a new amplifier. She still wants to beat everyone. She also wants to lift their voices.